The act of identifying, protecting, restoring, and reusing buildings, districts, and built landscapes of historic and cultural significance is, at its best, a reflective and consequential process of urban and socio-economic reform. It has the potential to reconcile conflicting memories, meanings, and cultural tensions, bridging and expanding the perceived boundaries of multiple disciplines towards bigger aspirations of city-making and social justice. How and where do such aspirations overlap and differ across nations and societies across the world? In places with different histories, governance structures, regulatory stringency, and populist dispositions, who are the specific players, and what are the actual processes that bring about bigger and deeper change beyond just the conservation of an architectural or urban entity of perceived value? 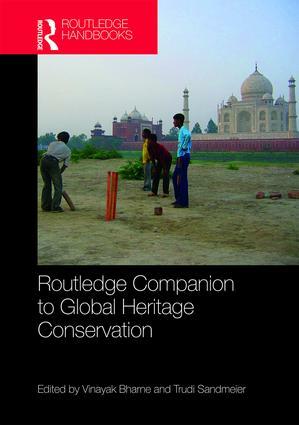 This collection of scholarly articles by theorists, academics, and practitioners explores the global complexity, guises, and potential of heritage conservation. Going from Tokyo to Cairo, Shenzhen to Rome, and Delhi to Moscow, this volume examines a vast range of topics – indigenous habitats, urban cores, vernacular infrastructure, colonial towns, squatters, burial sites, war zones, and modern landmarks. It surfaces numerous inherent issues – water stress, deforestation, social oppression, poverty, religion, immigration, and polity, expanding the definitions of heritage conservation as both a professional discipline and socio-cultural catalyst. This book argues that the intellectual and praxis limits of heritage conservation – as the agency of reading, defining, and intervening with built heritage – can be expansive, aimed at bigger positive change beyond a specific subject or object; plural, enmeshed with multiple fields and specializations; and empathetic, born from the actual socio-political realities of a place. This exciting addition to the literature on what, how, and why we preserve cultural resources and the tangible manifestations of history has extraordinary reach across intellectual and physical realms. Heritage conservation, or historic preservation, has been undergoing a radical rethinking globally, because of new contexts (climate change, population shifts, social and economic inequality, the rise of populism…) and new understandings of the ethical implications of existing theory, policy, and practice. The essays in this volume leap forcefully into these debates, using case studies from two dozen countries, and bringing the insights of an impressive array of new voices—both practitioners and scholars—to the conversation. The authors address a wide range of difficult and challenging issues that confront practitioners in heritage conservation, along with a broad diversity of sites, from indigenous habitats to war zones, classic landmarks to industrial compounds. Meanwhile, the editors have placed these explorations into a rich intellectual framework of themes and conceptual dualities that reveal the polarized discourse Bharne and Sandmeier see as heritage conservation today. The result is a provocative, stimulating, and profoundly useful text. This volume may well exceed heritage conservation to also be a guide of design consideration of projects throughout urban settings. It will be an essential reference for those who have just become curious about conservation because of an issue nearby, for those learning in college about "what is conservation anyway," and for those in professional practices who properly struggle with the complex range of conservation problems and opportunities at home and abroad. Having this volume available will help us work our way more regularly to public acceptance and cultural delight, extending heritage conservation globally. There are three seemingly obvious but often overlooked aspects of what makes a city so vital and vibrant: the city belongs to all of us; the city is combination of old and new; and the city is global. This book embraces all these crucial aspects of heritage conservation in the urban context, which is an issue at the forefront of the 21st century: What do we value as worth conserving? How do we do it and for whose benefit? None of these of questions have easy answers, but this welcome addition to the literature enables – and indeed, empowers – us to reconsider heritage conservation by paying close attention to pressing local challenges in an increasingly global context. In this regard, the scope of the book is breathtaking, taking us Bali to Jerusalem Los Angeles to Shanghai and beyond, while addressing a wide range of issues - from cultural landscapes to industrial heritage to earthquakes to military infrastructure. For those who may be new to the topic, the introductory chapter itself is a brief yet excellent overview of the major themes in the field. Perhaps this book’s most significant contribution is in the ways it reaches far beyond the usual aesthetics and materiality of the objects to be conserved and critically examines relatively invisible aspects such as the underlying perceptions, approaches, and values that actually drive global heritage conservation yesterday, today, and tomorrow. Vinayak Bharne is Adjunct Associate Professor of Urbanism and Heritage Conservation at the University of Southern California, USA, and Principal and Director of Design at the architecture and urban design firm Moule & Polyzoides, USA. His books include The Emerging Asian City: Concomitant Urbanities & Urbanisms (2012), Rediscovering the Hindu Temple: The Sacred Architecture and Urbanism of India (2012), and Zen Spaces & Neon Places: Reflections on Japanese Architecture and Urbanism (2013). Trudi Sandmeier is the Director of Graduate Programs in Heritage Conservation and an Associate Professor of Practice in Architecture at the University of Southern California, USA. Her work centers on the conservation of the recent past and efforts to make visible the impact of underrepresented constituencies on the historic built environment.